Sri Guru Jee’s writings help us understand the need for Saadh Sangat in the dark age of Kaljug, where the only true support is that of His Name. Kaurs United sevadaars have a dream to become that Saadh Sangat; the support and strength that many Kaurs are searching for, in order to fully live according to the Gurmat Maryada of Guru Gobind Singh Ji and ascend to becoming the mothers of the future Khalsa. In the glory of past and present Shaheed Singhs and Singhneea, we hope to strengthen ourselves and others, for not just the betterment of Sikh women, but the betterment of the entire Khalsa Panth, and therefore, the entire world. Our first camp was graced with some very blessed and pure souls, who were able to contribute to every diwaan, langar, and discussion with all of their knowledge, seva bhaavna (intentions) and experiences. Some highlights from our first camp include the craft gift exchange, late-night simran, amrit vela diwaans, impersonal and personal discussions, the sharing of experiences, pains, and pressures, the divine aura of Guru Nanak Parkash Gurdwara Sahib itself, and the Sangat of so many blooming and blessed daughters of Sri Guru Gobind Singh Ji. For Kaurs United's 2006 B.C. Camp, there will be a multitude of challenging, exciting, and inspiring activities. Campers will attend focused lectures and discussions, as well as participate in an array of physical activities like archery, Gatka, fun on the beach, and so much more! A fond memory campers from last year have is of the serene morning and evening Darbar sessions, full of Gurbani recitation, Simran, and Kirtan, as well as Katha about Sikh history and Sikh women. Campers will be divided based on age for activities, however most discussions and activities will only be suitable for girls aged 12 and up. Click here to continue reading and learn more information for Kaurs United Camp 2006! Sikh sacred music & meditation. Renew with the powerful techniques of Kundalini Yoga & Martial Arts. Relax in Mother Nature’s Embrace. The challenge and delight of a woman’s life is to find her center, to balance herself in the sacred, and in the joys and challenges of life. She is the center of so much, for so many. From her center, love and power, confidence and harmony flower. 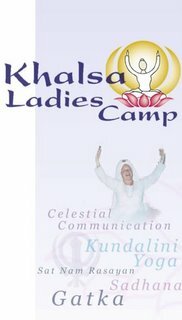 Khalsa Ladies Camp is dedicated to this fulfillment. The activities are designed to help the woman nurture and develop the areas of her life which facilitate this process. The call has come forth for we, as women, to assert our prayerful presence and grace into so many areas of our lives. So many people depend on us in countless ways. In order to be true to ourselves and those whom we love, we need to increase our vitality, and balance our energy. And, most important, we need to develop a relationship with our own soul and the purpose of our lives. This retreat is designed to help one another on this journey. 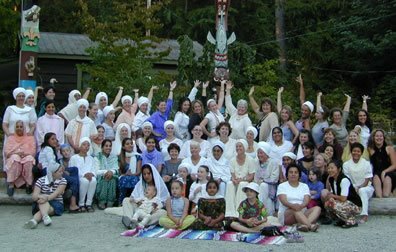 With a full schedule of the revitalizing practice of Kundalini Yoga, the deeply peaceful sacred space of Sat Nam Rasayan Meditation, the graceful power of Sikh Sacred music, and the exilharating practice of Indian Sword Fighting, we renew ourselves and offer support to one another, make new friends, and connect with old ones. Women of all ages may attend this retreat each year, honouring the wisdom, sacredness, and strength of woman. Join one of these camps this Summer! BHANJIII ARE You Gona come to Kaurs United :D :D :D YOU SHOULDDD , or even khalsa ladies camp, are you gona come:D?